David Fincher‘s The Girl With The Dragon Tattoo is the first instalment in a Hollywood adaptation of Stieg Larsson‘s thriller trilogy, originally released as a Swedish-language screen adaptation directed by Niels Arden Oplev in 2009. This English-language remake follows investigative journalist Mikael Blomkvist (Daniel Craig) who is asked to help discover the truth about a woman who has been missing for forty years. Her body was never found, yet her uncle is convinced that a member of his own dysfunctional family has murdered her. This is where Blomkvist meets Lisbeth Salander (Rooney Mara), a young, gothic computer hacker, who Blomkvist hires to help him find “a killer of women”. As the mystery uncovers, we soon start to discover the disturbing truth about Lisbeth’s past and present as well. The opening title sequence featuring Trent Reznor’s and Atticus Ross’ thundering cover version of Led Zeppelin’s Immigrant Song introduces the film brilliantly. As Daniel Craig and Rooney Mara are drowned in liquid monochrome, we are given subtle hints to what the film has to offer and also what we can expect from the second two films in the franchise. Not only is this sequence visually appealing, it also gets your blood pumping for the ride Fincher is about to take you on in this dark yet fascinating franchise. This latest adaptation is both brilliant in itself and also great in comparison to its Swedish predecessor. Not only was it an advantage to not have to read any subtitles, Fincher’s take on the film managed to be somewhat sexier, whilst also adding a slight hint of humour to take the focus away from the film’s dark backdrop. Whilst there are some scenes that are quite tough to take in, ones that would naturally force the audience to face away from the screen for a few minutes, there was no way better that Fincher could have worked with these circumstances. As the camera initially zooms out from the bedroom door, I had hoped that Fincher might have chosen to skip Lisbeth’s disturbing situation. But firstly, why would Fincher even consider skipping out the darkest, albeit upsetting, scene of the film? And secondly, it wouldn’t have had the same effect at all if we had not seen Lisbeth’s tortured present, which will mean a lot more during the final two instalments of the trilogy. It’s a hard mix of genres and emotions to both work with and deal with as a viewer, but it is this unpleasant focus that the novel is all about. The very slight use of humour was enough to stop you from tensing in your seat without evoking a roar of laughter from the audience to ruin the ambience, which was an amiable distinction from the Swedish version where we would not have been able to pick up on this tone. Both of these films focused on much of the same plot, occasionally adding something one had missed out on but also glossing over parts that the other had focused on in a better light. For this English adaptation, the end of the film was one of the main differences, putting a lot more emphasis on Salander’s plan to get Blomkvist out of trouble. Although the film lasted for 158 minutes, it in no way felt that it was getting boring or that it dragged on. This end scene did feel like it could have had less of a focus like the Swedish one did, but then it eventually ended in a much better way with the audience seeing some real emotion from Lisbeth as she rides off. It is this relationship between Salander and Blomkvist that is the main focus. The scene mentioned above and one where Salander says, “Put your hand back under my shirt”, were a great inclusion. It may again be because of the language barrier, but it felt that Craig and Mara had more of a connection than Michael Nyqvist and Noomi Rapace in Oplev’s version, even if Blomkvist had better things to think about during some of their sexual encounters. Some of the smaller cast members were also great, especially Stellan Skarsgård as Martin Vanger and Joely Richardson as Anita. One that did bemuse me a little though was Alan Dale as Detective Isaksson because, let’s face it, he doesn’t suit a fat, local policeman when we know him primarily as Charles Widmore from Lost. Ultimately, it was Mara that completely took the stage, whilst Craig only too happily took the back-seat. 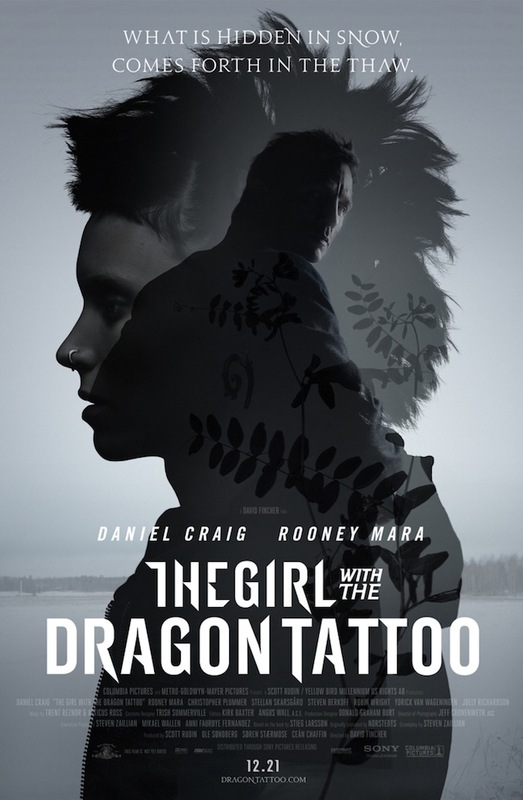 Mara’s fearless lead role was outstanding, and as for Craig, who I have really become a fan of over the past year, his role in The Girl With The Dragon Tattoo has only made me like him more. Both were excellent choices for the film, and it is through them the film exceeds to such a high quality. Like Zombie Films? What About ‘Shaun Of The Dead’ Lego?